LA JOLLA–(March 22, 2019) Similar to the dozens of Sherpas that guide hikers up treacherous Himalayan mountains to reach a summit, the nervous system relies on elaborate timing and location of guidance cues for neuronal axons–threadlike projections–to successfully reach their destinations in the body. Now, Salk Institute researchers discover how neurons navigate a tricky cellular environment by listening for directions, while simultaneously filtering out inappropriate instructions to avoid getting lost. The findings appeared in Neuron on March 19, 2019. The brain controls hundreds of different muscles to allow for precise movement. During development, motor neurons in the spinal cord extend their axons outside of the central nervous system to connect with muscle cells in the body. Every motor neuron relies on a set of genes to ensure the axon grows correctly to the muscle. To find genes important for motor-neuron axon guidance, the team carried out a genetic screen and observed where the motor neurons grew their axons using green fluorescent proteins in a mouse model they engineered. The team then traced the axons to see when correct and incorrect growth decisions were made. Through this axon tracing, the scientists identified a gene mutation that caused motor axon misrouting. In this case, the motor neuron axons took detours and never connected properly to the muscles. Upon closer investigation, the scientists found that these motor neurons climbed up the edge of the spinal cord rather than properly exiting to meet their muscle targets. The team pinpointed the gene causing this detrimental mutation as p190, which was previously known to play a role in cancer suppression, but had not been implicated in establishing neuronal connections during development. 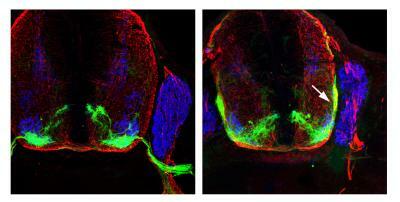 The researchers set up a series of experiments to examine how p190 affects axons leaving the spinal cord. They found that, although axons are normally attracted to a protein in the spinal cord called netrin, during a short time window p190 acts as a blinder, so the axons disregard netrin and are led outside of the spinal cord. After the axons safely leave the central nervous system, this blinder is removed. Without p190, the axons are attracted to netrin and do not properly leave the spinal cord, so never connect with muscles. The next step is to examine the control mechanism of p190, and what factors impact the timing of its activity, say the researchers. Other authors included: Onanong Chivatakarn, Matthew J. Sternfeld, Shawn P. Driscoll, Aaron Aslanian, Karen Lettieri, Miriam Gullo, Joseph W. Lewcock and Tony Hunter of the Salk Institute for Biological Studies along with Fabiola Valenza and Aurora Badaloni of the San Raffaele Scientific Institute in Italy. The work and the researchers involved were supported by the Howard Hughes Medical Institute, the Sol Goldman Trust, the European Research Council Starting Grant 335590 and a Career Development Award from the Giovanni Armenise-Harvard Foundation.